Due to the bad weather continuing over the Andes Cordillera (rain and snow), the Chilean authorities were forced to close, for the night, the border at Paso de San Francisco, situated at 4700m. 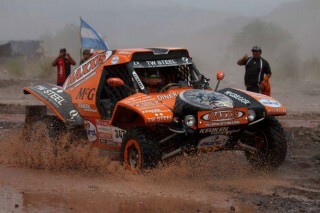 For the 7th time, the Dakar Rally Cars is about to cross over the Andes, and because of very unfavourable conditions, added to the fact that the course has been hit by rain and snow, in order to guarantee the security of the competitors and those following the rally, the organisers have decided to organise a convoy for all vehicles tomorrow. The itinerary has been changed after the border (follow the main road on the right which goes to Diego de Almagro).